Sixty-four unique and entertaining activities will keep young children, along with their parents and caretakers, busy all day-even when it's pouring outside. Indoor fun includes art projects such as finger painting and cereal mosaics, silly games like a "Rainy Day Backwards Party" and a "Perfectly Preposterous Parade," cooking activities with simple recipes, and educational activities like counting games and elementary science experiments. 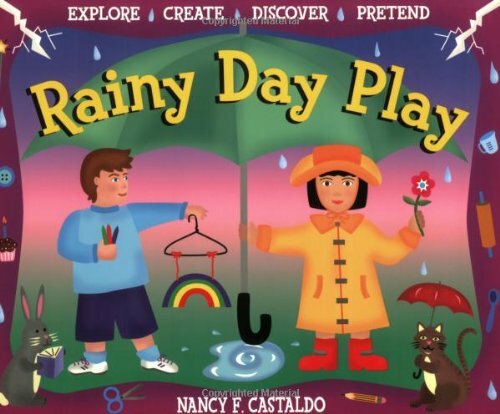 The book also invites children to play outdoors (if it is warm and not raining too hard) with activities like taking a puddle walk, playing leapfrog in the squishy grass, and making mud pies. Parents and caretakers will appreciate these constructive activities, which encourage learning and understanding while keeping kids entertained on rainy afternoons.